Although the Akto Turkmen are considered part of the Kirgiz nationality, their language and customs are more closely related to that of the Uygur. They claim originally they came from Samarkand, which lies in present-day Uzbekistan. The Akto Turkmen are a unique ethnolinguistic group. 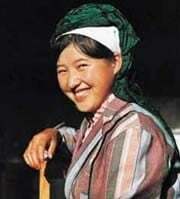 Their customs and physical features are also distinct from all other groups in Xinjiang. The history of the Akto Turkmen is uncertain. They claim to have migrated long ago from Samarkand to their present location in China. 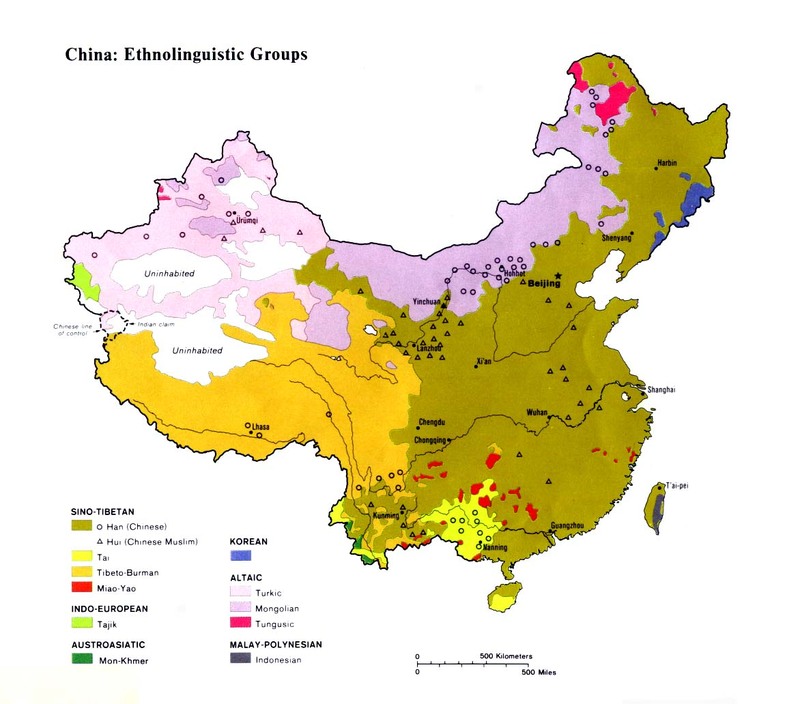 The Akto region is a part of China that has been rocked with conflict. In April 1990 an "armed counter revolutionary rebellion" occurred in Baren Township of Akto County. "There were over twenty deaths, mainly of members of Islamic minorities. Later in 1990 ... fifty mosques were closed down and the construction of 153 others was halted." These people are skilled shepherds and goatherds despite the harsh landscape where they must raise their animals. Their clothing, food, and housing all reflect their seminomadic, pastoral lifestyle. The diet of the Akto Turkmen consists mainly of animal by-products, complemented with cabbage, potatoes, and onions. They store their butter in dried sheep or cattle stomachs. The Akto Turkmen are Sunni Muslims who observe both Uygur and Kirgiz religious festivals, along with some rituals they have retained from their pre-Islamic religion of shamanism. 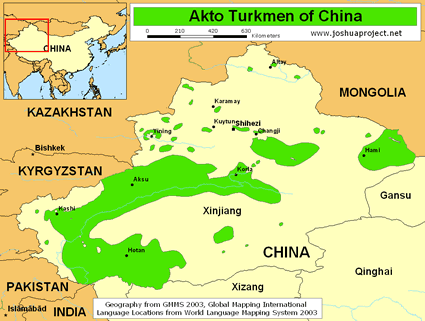 Most Akto Turkmen can read the modified Arabic script used by their Uygur neighbors. No record exists of any mission work being conducted among the small but proud Akto Turkmen people group. They are strongly bound to their Islamic beliefs, which form their ethnic identity, and to their own ancient form of shamanism and black magic. Few Akto Turkmen have had the opportunity to hear the gospel and intelligently respond to the claims of Christ. Probably the best opportunity for the Akto Turkmen to hear about Christ is through the Uygur gospel radio broadcasts that have aired in the region for the past several years. View Akto Turkmen in all countries. Location in Country: They live in two large villages, Kosarap and Oytak, south of Kashgar in the Xinjiang Uygur Autonomous Region.